When I started making this dinner, I didn't think it was going to be BAD, but I have to say that it completely surpassed my expectations with just how freaking delicious it was. Sunday was grocery day (always my favourite day; I consider it like a weekly shopping free-for-all), and I picked up a big side of salmon (yum!). I also picked up what seems like a metric ton of veggies and fruits. 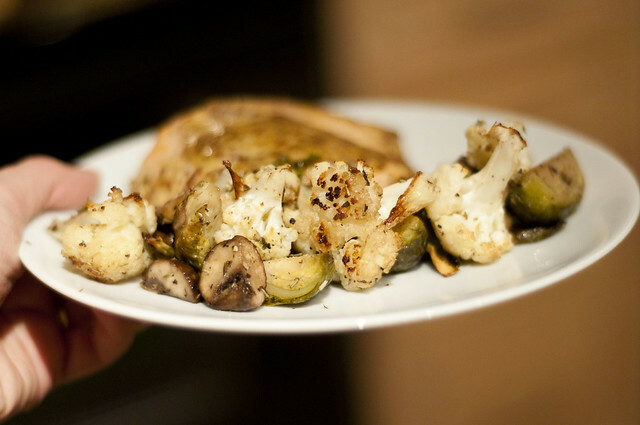 I was flipping through a couple of recipe books, and came upon a recipe for roasted cauliflower with shitake mushrooms in Clean Start, and I knew I"d found the inspiration I needed. I changed up the method and seasoning a bit, and I had cremini mushrooms instead of shitakes, but the combination is fabulous. On its own, this is a great vegan dish that would be a great accompaniment to something like a quinoa bowl, or a risotto-type dish. And I don't even really like brussels sprouts. I loved how all of the vegetables gained a nice caramelized sweetness, and the umami meatiness of the mushrooms was the perfect textural contrast. 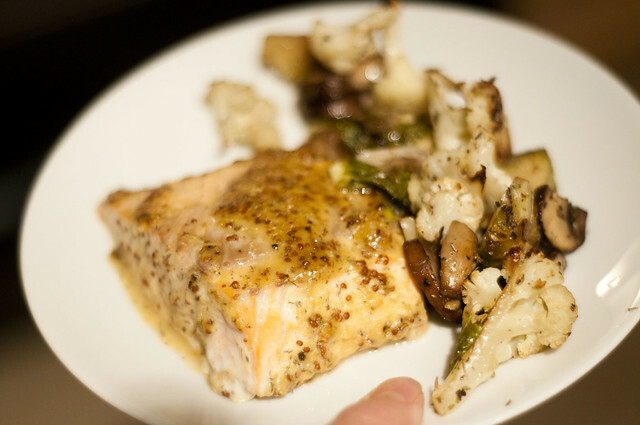 With my salmon, I did a really simple maple-mustard sauce. I just love this flavour profile with salmon. Since salmon is so rich and fatty, I really like the acidity of the mustard, paired with the sweetness of the maple syrup. You could also be lazy and use a commercial honey mustard, but I tend to find most of those REALLY sweet and lacking in flavour. This way you get the acidic bite of a dijon, the al dente bursts of a grainy mustard, with a garlicky wallop of flavour. Fresh herbs (like dill or even basil) would be great in this, but dried dill was pretty wonderful too. You could use this sauce on pretty much any other protein/vegetable, or even as a dipping sauce for chicken or veggies (though maybe tone down the garlic if it's not going to be cooked). I served these two dishes with a fresh green salad, topped with my favourite store-bought dressing, Farm Boy's Lemon Garlic (love it because the ingredient list is lemon juice, olive oil, salt, pepper, garlic. That's it. Can't beat that!). 2. 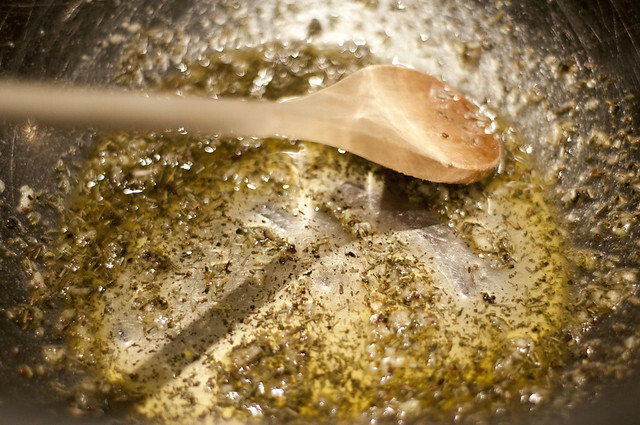 In the bottom of a large bowl, combine olive oil, salt, herbes, garlic and pepper. 3. 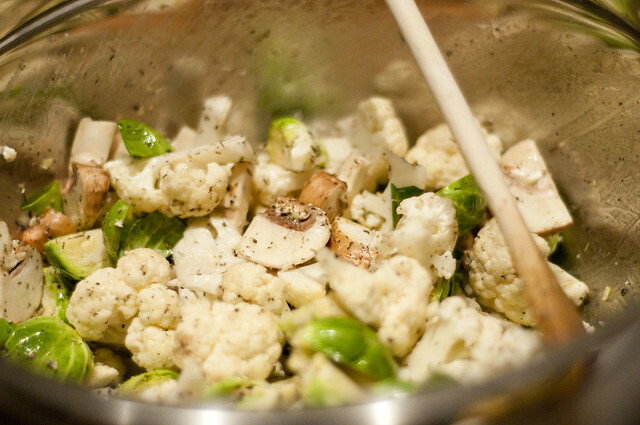 Chop the cauliflower into bite-size florets. Put in bowl. Coarsely chop mushrooms (I had big ones and cut them in 6-8 pieces). Quarter brussels sprouts (or halve if they aren't big). 4. Toss all vegetables in the oil mixture; stir until everything is coated. 5. 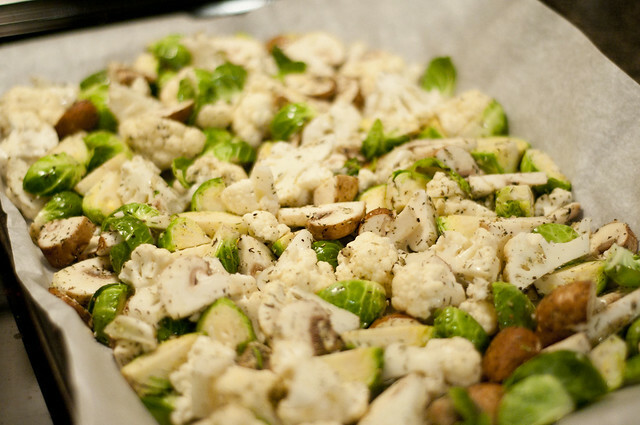 Spread out on a baking sheet (I like to use parchment paper so nothing sticks AND I don't have to wash my baking sheets. It's win-win.). Roast for 20 minutes. Stir and re-distribute. Roast for another 20 minutes, or until tender. 1. Cut salmon/prep salmon how you like it (this would also work with salmon steaks, bbq salmon, cedar plank salmon, etc.). Preheat oven to 400F (or bbq; it's up to you). 2. 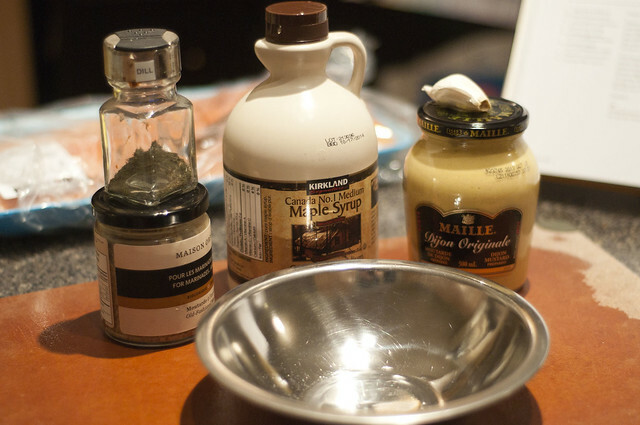 In a small bowl, combine mustards, maple syrup, garlic, dill, salt and pepper. Taste (you might like it more mustardy, or sweeter, so this is your chance to adjust it to your liking). 3. 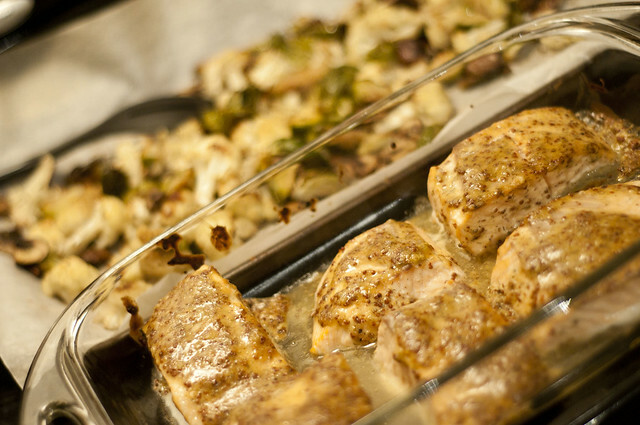 Place salmon fillets in a 13x9 glass dish (or a baking sheet, or whatever you have). 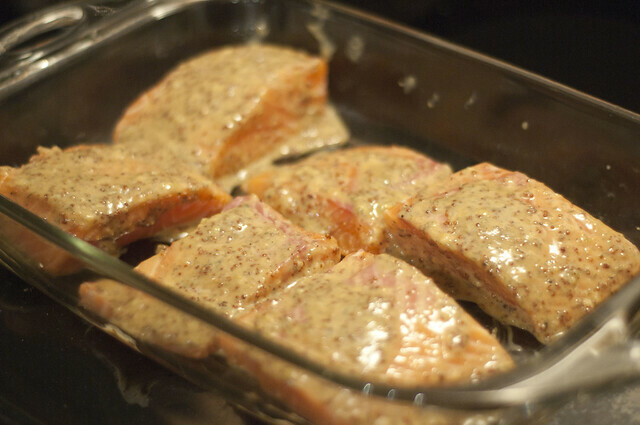 Put a little bit of the mustard mixture on each fillet (about one teaspoon), spread around. Flip the fillets over, and divvy the rest of the sauce up over the fillets. 4. Bake at 400F for 10-20 minutes, depending on thickness (mine were quite thick and took 18 minutes). Start checking at 10 minutes, especially if your fillets are thin. 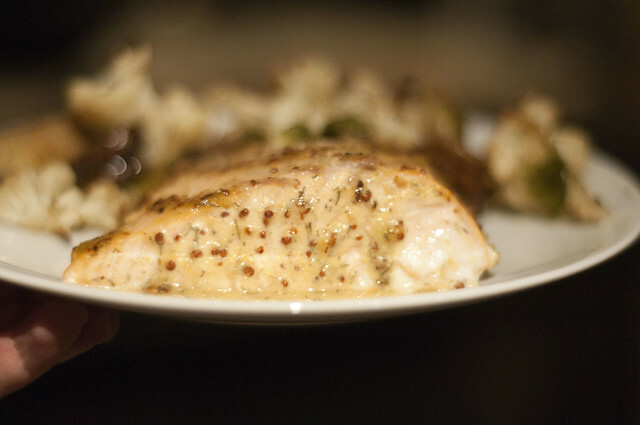 Salmon is done when it flakes apart easily and is opaque all the way through. I don't like mine overcooked and would prefer to err on the side of slightly undercooked, but this is a matter of personal preference/comfort. And on a quick technical note, apologies for the weird looking photos. Hubs re-installed windows and has not yet installed Lightroom. I am super Photoshop challenged, so did the best I could to hack away at the processing on these photos, but they still look weird. For this, I apologize. Thanks for reading! Yum! This would be the perfect recipe to share at a dinner party. Thanks for the tip!